AutoInstall SSL™ - It's An SSL Revolution! In this day and age, you can access almost anything online in mere moments. A whole world's wealth of knowledge is just a single click away. There's seemingly no limit to what you can do online! Play games, send messages across the world, manage your finances, share photos, follow your favorite sports team, the list goes on and on. So, why does it seem that the world of SSL is still stuck in the Stone Age? "I ordered the SSL – why don't I have it yet?" "Pending? What do you mean pending?!" "Certificate? Like a gift certificate?" But here at The SSL Store™, we're taking a stand. A stand on behalf of web hosting companies, IT service providers, domain registrars, and all other businesses operating in cyberspace. A stand against the tedious manual labor required when providing your customers with a reliable SSL certificate. We're starting an SSL revolution. Will you join us? This technology was designed to streamline the SSL process and make our resellers' lives easier. 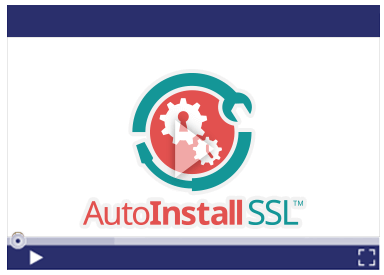 With AutoInstall SSL™, the name says it all, as it will generate the CSR, validate the domain, download and install the certificate, and verify the installation automatically. That's right, with the simple click of a button, virtually all of the time-consuming manual labor is automatically completed right before your customer's very eyes in real-time. What Makes AutoInstall SSL™ So Revolutionary? This state-of-the-art technology works for all three types of SSL certificates – DV, OV, and EV. Additionally, AutoInstall SSL™ works across all of our major brands, like Symantec, RapidSSL, GeoTrust, Thawte, and Comodo. AutoInstall SSL™ is currently available FOR FREE to all of our active resellers via our cPanel and Plesk plugins. We are also currently developing a Windows Desktop and Linux version that are not far behind. So, what are you waiting for? If you're tired of living in an SSL world full of hassle, unnecessary refunds, and customer frustration, then join us. Become a part of a true SSL revolution. Sign up for your FREE reseller account today so you can introduce your customers to this brave new SSL world and leave your competitors in the dust.